The enchanting Presidio Pet Cemetery is located on a tiny patch of land along Crissy Field Avenue under the Golden Gate Bridge on-ramp. The love that pet owners feel for their animals radiates from here, the eternal resting place of birds, dogs, and cats for more than 50 years. 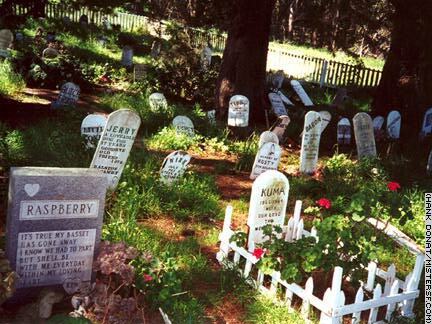 Started by a Presidio veterinarian, the cemetery was later cared for by the Boy Scouts. Laddie, Martha, Poo, Spot, Princey, Raspberry and Mr. Twister, even a collie named King are all here, devoted companions in the hereafter. Markers are lovingly inscribed including one for a pet named Trouble that states, "He was no trouble."